An Evison/Poulsen® cultivar introduced 2010. 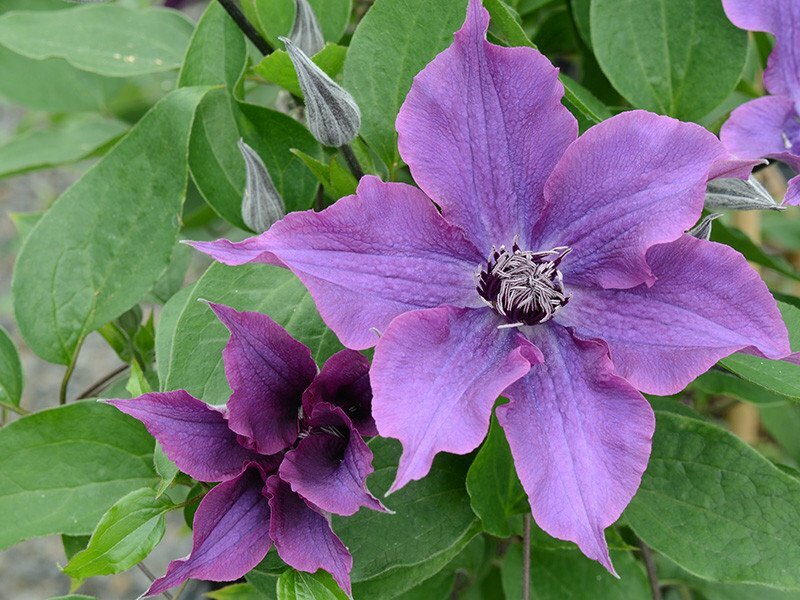 This is a short-growing clematis ideal for growing in a mixed border with other plants or for allowing it to grow up into a willow or hazel wig-wam. It grows to about 3-4ft (1-1.2m) in height and will flower in late May-early July. It will produce further growth for late summer and early autumn flowering. It requires hard pruning each early spring when all top growth should be removed down to 6” (15cm) or slightly harder as a young plant. Should it be grown on a hazel or willow support then these can be renewed annually. The plant has good strong stems which produce flowers down the stem: it is multi-flowering producing mauve-purple flowers with twisted sepals about 3” (7cm). The flowers have purple anthers which form a most attractive centre to the flower. It looks marvellous with grey, golden or golden variegated low growing shrubs and it is ideal for the smaller garden.